Colorado entrepreneur is the poster-child for vertical integration. Micro-vertical integration is what happened when Dale Katechis allowed himself to fall down the rabbit hole of marketing, follow his passions, and then invite his employees to do the same. Once simply a restaurant owner in Lyons, Colorado, Katechis has since launched Oskar Blues Brewery (which distributes nationwide), started a small diverse farm, opened multiple burger joints serving locally grown all natural beef — and went into the bicycle building business, too. Why not? “We have sort of a Willy Wonka business culture at Oskar Blues where we find the areas we as a group are passionate about and go out and excel at them,” Katechis explains. Farmer Geoff. As with most of his adventures, Katechis had no direct intentions of getting into production agriculture. He purchased a 50-acre farm in the hills of Longmont as an investment opportunity. Then he got the idea of trying to grow some hops for small-batch specialty beers. Hops was the main focus, so Hess put together a plan for 2 acres of hops trellises, but he didn’t stop there. “Geoff had a background of farming and raising cattle and pigs, so we expanded the original idea and Hops and Heifers was born,” Katechis says. Hops and Heifers Farm is what became of Katechis’ 50-acre property investment. Not only did they establish hops, but utilized the grass and spent mash from the brewery to raise all natural Angus heifers. They threw in some Berkshire hogs, too. Heifers mean beef, which got Katechis thinking about a boutique-type burger restaurant to even further integrate. “Chuburger is really a celebration of the farm,” Hess says. A shovel serves as the door handle, and once inside the restaurants — there are three now — photos of the farm are most of the decor. 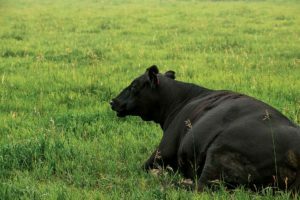 An Angus heifer lounges in the pasture as brewery tours make their rounds. While Katechis is chasing passions and likes the fun integrated circles he’s made with his ventures, make no doubt he knows the marketing value. Having traveled the United States working with restaurants, grocery stores, and distributors, he’s got some great insight into food marketing. He’s proven this in Colorado as his burger joints have expanded beyond the scope of his little farm, and the farm itself has become a highlight of the Oskar Blues Brewery tour. Having created demand, Katechis had to start working with other area producers to keep the burgers coming. He recently partnered with Meyer Natural Foods as a supplier. “We’re not beef producers,” Hess says. “We’re a hobby farm, so we had to make some changes as the businesses grew.” In keeping with Katechis’ traditions, Meyer offers natural beef using environmentally sound processes. He works with farm suppliers to incorporate mash from Oskar Blues Brewery in the livestock feed. They can also track their burgers back to the farm, an important piece. There are still heifers and hops on the farm, but it’s more of a showplace. here are ag lessons to be learned from this show farm, though. Not only is shipping cheaper, but there is value in the connection between consumer and the producer. 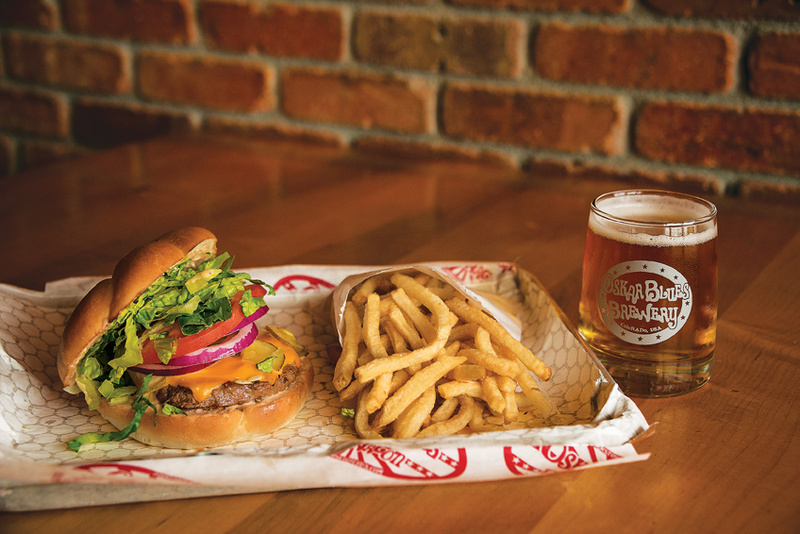 His beer business started in the basement of his restaurant and went nationwide, and the Chuburger restaurants inspired by a 50-acre hobby farm may one day do the same. But Katechis hopes to still capitalize on the valuable local angle as they grow. “Demand outgrew our supply for Chuburger almost immediately so we had to reach out to other local farmers and create relationships to supply our restaurant,” he says. “That’s something I hope to continue doing as we move into new markets.” Of course each new farm will need the Hops and Heifers stamp of approval. A hobby grows to feed Music City. Tight margins put new focus on in-season applications.